As a Vegetarian parent, I am always on the look out for books and resources which I can use to teach my kids about being Vegetarian. Although my kids aren't completely 100% Vegetarian, I still want them to understand what it means to be Vegetarian, why I choose not to eat Meat or Fish, and why we eat Vegetarian at home. Lately, my 4 year old has shown more of an interest in becoming a Vegetarian. She often proudly comes home and tells me that she chose the Vegetarian option for school lunch. Last week, she informed me that she told everyone on her dinner table that her Mummy is a Vegetarian and doesn't eat meat or fish - Do I sense a little activism starting? 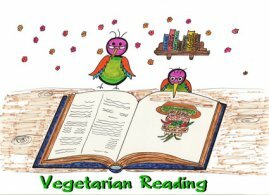 Anyway, as my kids do eat mainly Vegetarian at home, I think it's good for them to have books to read which teach them about being Vegetarian and to understand Vegetarianism and following a Vegetarian diet. 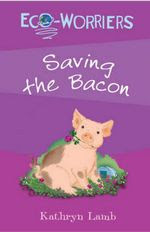 There are some lovely Vegetarian story books on the market which cater for all ages. 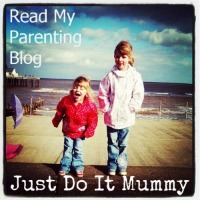 I thought I would share with you my top 5 which are suitable for little ones through to about 7 or 8 years old. That's why we don't eat animals, a story of Vegans, Vegetarians and all living things by Ruby Roth, is a Vegetarian version of the nursery rhyme 'to market to market, to buy a fat pig' . It takes a look at how animals are treated on factory farms and introduces the concept of factory farming to young readers. The beautiful artwork featured in the book shows animals in their natural state exhibiting natural behaviours, and also in the factory farm sad and living in poor conditions. It also introduces the concept of how eating animals affects the environment, rain forests and endangered species. The book ends with all of the animals going home to eat some delicious vegetable soup. Again, I would say that this is aimed at the 5 to 10 age group, although younger children will love the story and the pictures, but might not tap into the message of the book. Hubert is a pudge. Instead of growing up, they are taken to the meat factory when still young and made into TV dinners, microwave dinners, sausage links, and other greasy food products. However, Hubert succeeds in escaping to the wild, where he feasts on luscious grass, exotic orchids, and skunk cabbage. As he eats more, he grows bigger and bigger. Soon Hubert is the biggest pudge since ancient times. He is giant! He is humongous! And he must fulfill his destiny. From the singular Henrik Drescher comes a quirky fable about the responsibilities that come from being larger than life. Twas the night before Thanksgiving is from the US and a parody of the Clement Moore poem 'Night before Christmas' . 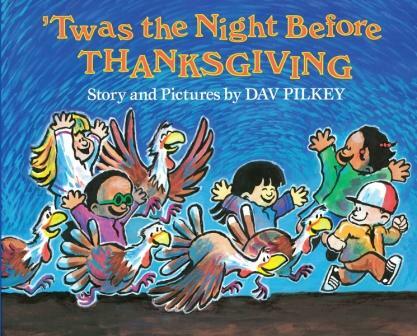 Eight boys and girls from all races visit a turkey field the night before thanksgiving. There, they meet eight baby turkeys and upon seeing the farmer with his axe, discover that the turkeys are to killed for thanksgiving Dinners. The children, with feathers peeking out from under their clothes, smuggle the turkeys home on the bus and join their families for eight Vegetarian dinners. This is a great book for younger children up to around 8 years old. Eco-worriers, Evie and Lola, are very concerned about food and have become Vegetarian. They are also trying to encourage everyone to eat healthy, locally sourced, organic produce and throw away as little as possible. So they're delighted that their friend, Meltonio, feeds all his leftovers to his pig, Samson. But then the girls discover that Meltonio is fattening Samson up for his Christmas dinner table! What can they do to save the bacon? 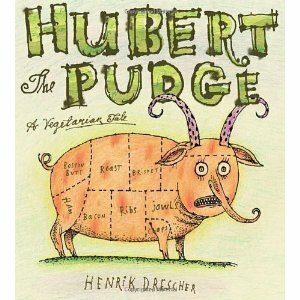 So if you are Vegetarian and looking for some Vegetarian story books to share with your children, I can highly recommend the books above. Storybooks can act as a springboard for a wide variety of activities to develop children’s English language skills and bring other areas of the curriculum to life, through the theme or content of the book. They are also very motivating as they exercise children’s imaginations and appeal to different interests and learning styles.